Want to build your own WordPress auction site like eBay? Thanks to WooCommerce and some add-ons, it’s surprisingly easy to start running WordPress auctions. Now, you might not become quite as large as eBay, but you can still do some pretty cool things for surprisingly cheap! In this post, I’m going to share a step-by-step guide for how you can easily create your own WordPress auction site using WooCommerce and another plugin. 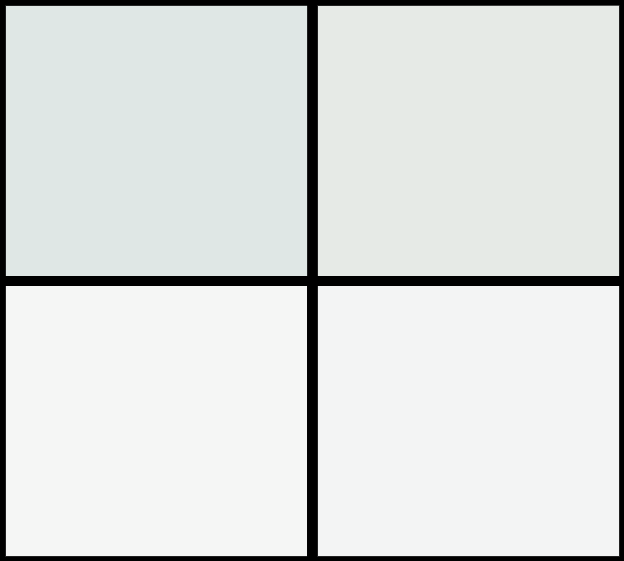 Depending on where you’re starting from in the process, you might need some of these elements listed below. First of all, you’ll need to find a WordPress hosting account and a domain name. Quite often you find a hosting provider with free domain names provided. In addition, it’s not a bad idea to consider a hosting account that has specialized WooCommerce hosting. An SSL certificate for accepting payments securely. Many hosts offer free, easy-to-use Let’s Encrypt certificates, nowadays. Once you’ve installed WordPress on a host with an SSL certificate, you’re ready to install WooCommerce and create your WordPress auction site. WooCommerce is the plugin that turns your website into an eCommerce website. It’s your eCommerce base that you’ll later turn into a custom auction site with a WooCommerce extension. 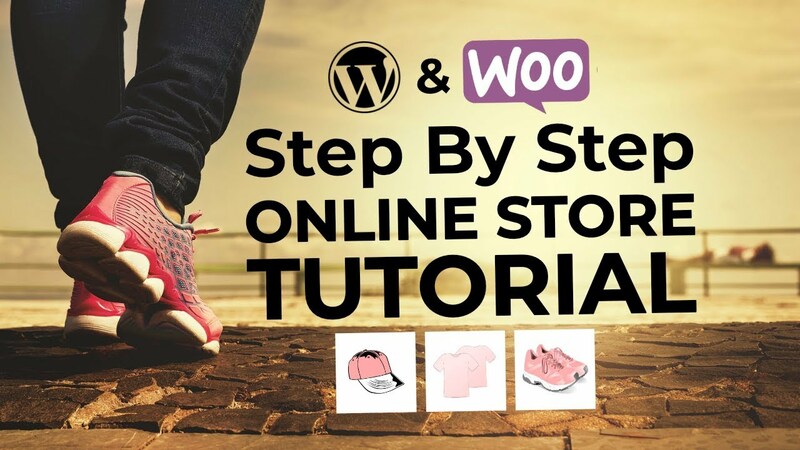 To get started, download and install the WooCommerce plugin. 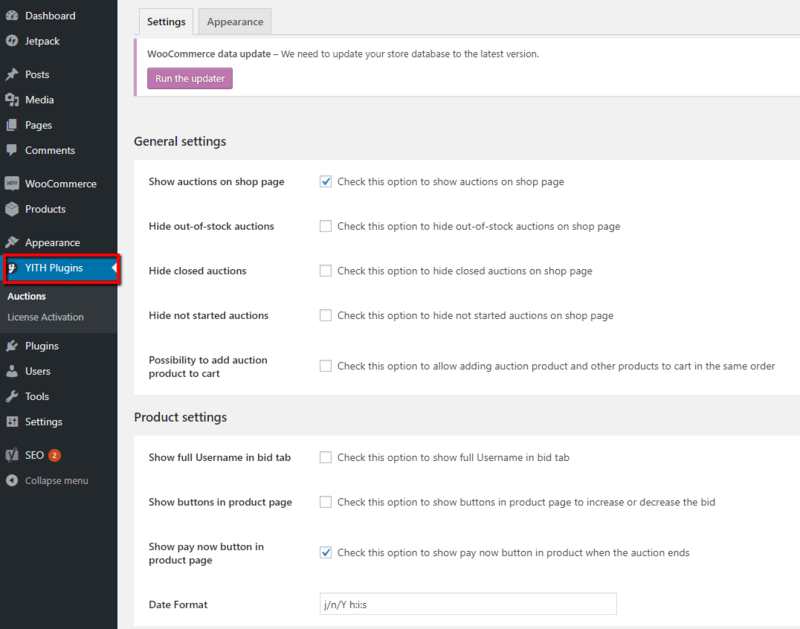 Check out our WooCommerce tutorial if you need help configuring the basic WooCommerce settings. That’s pretty much all you have to do. After the activation, you’ll find the WooCommerce tab in your dashboard, along with extra tabs for products and other items. The only problem is that your current eCommerce site doesn’t support auctions. To fix that, you’ll install the YITH WooCommerce plugin. The majority of the reputable auction plugins are paid. 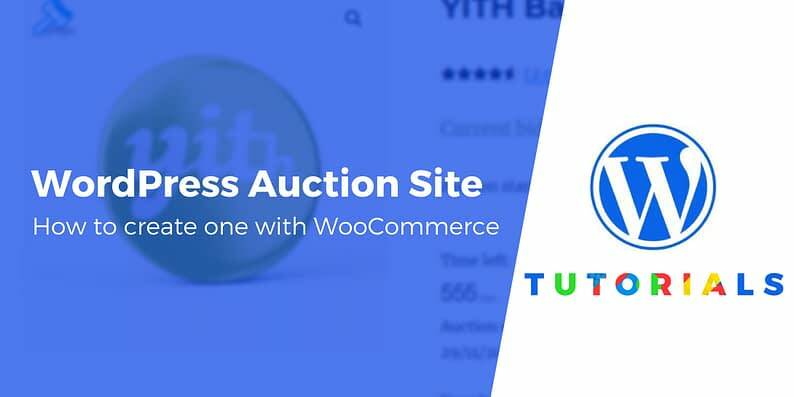 You can find a few on CodeCanyon, but one of the most popular is called YITH WooCommerce Auctions. It costs 81 Euro, or around $95 USD at the time of this article. Add the plugin to your shopping cart and walk through the process of paying for and downloading the plugin. Once you have it installed and activated in your dashboard, you’ll need to locate your license activation information in your YITH account. Navigate to the YITH Plugins tab in your dashboard and click on License Activation. Here, you paste in your license key. Make sure you click on the Activate button to complete the process. Before getting started with adding products and running auctions, it’s essential to make sure all settings are correct. The options that are already checked off work pretty well for getting a basic auction site up and running. For instance, you’ll most likely want to show your auctions on the Shop page. I recommend scrolling through these settings to see which are the most important for your business. Hiding out-of-stock auctions – A customer wouldn’t be too happy to win an auction and realize that the product isn’t in stock. Hiding closed options – This reasoning is the same as hiding out-of-stock auctions. Show buttons in product page – This makes it easier for people to increase and decrease their bids. Adjust the date format to fit your country’s norm. I would also want to have emails sent out before an auction ends. It might only be a few hours or minutes, but it gets people excited. Allow subscribe auction – Of course you want users to subscribe to certain auctions. 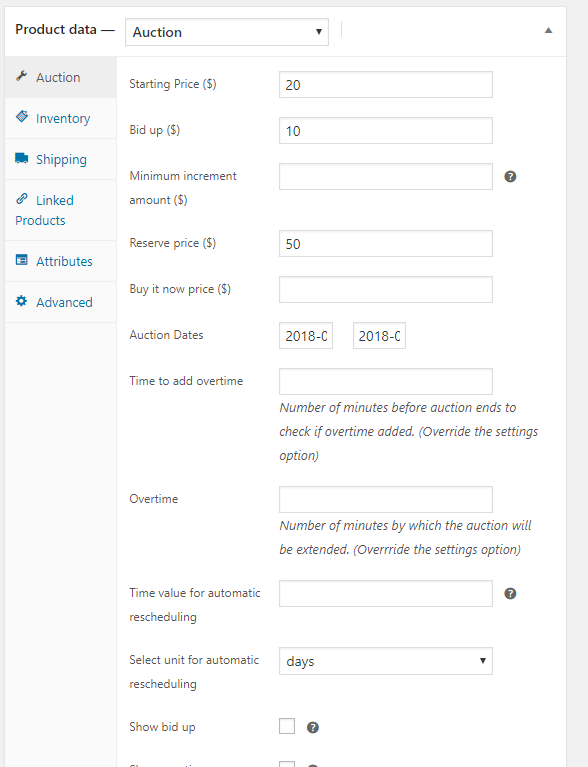 Automatic auction rescheduling – You can automatically set an auction to reschedule if it has no bids. Once again, all of these settings are completely up to you. I simply want you to realize where they are located and the purposes of each one. Finally, make sure you save the changes. Managing WordPress auctions is rather fun once you get the hang of it. 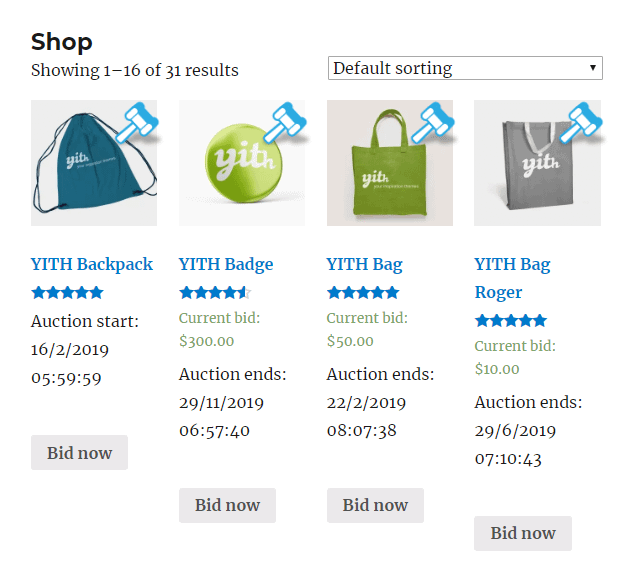 YITH makes it easy to add your first product and get the auction rolling for your current users. You can even test it out beforehand with some friends to see how it works. In order to launch your first auction product, you utilize the WooCommerce portion of the equation. Go to Products > Add New in the dashboard. 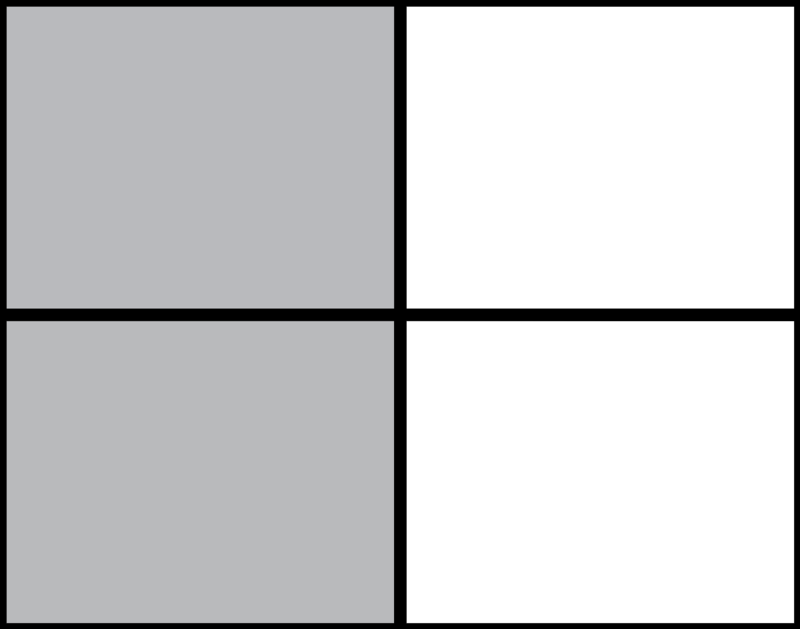 Many of these settings are identical to the normal WooCommerce product options. But to specify that this is an auction product, you need to scroll down to the Product Data section. 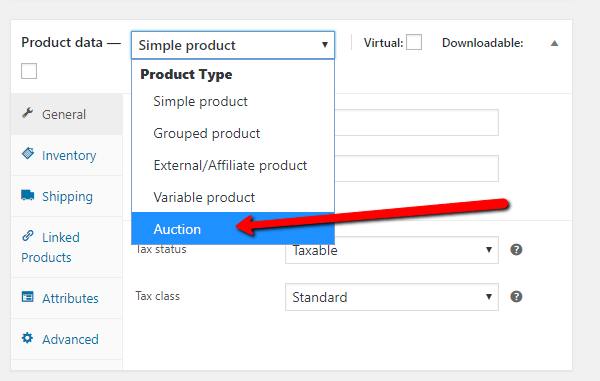 Use the drop-down menu to make this product an Auction item. Fill in information like the starting price, bid up, minimum increment amount, and the reserve price. You also have settings for auction dates, overtime, and tax status. 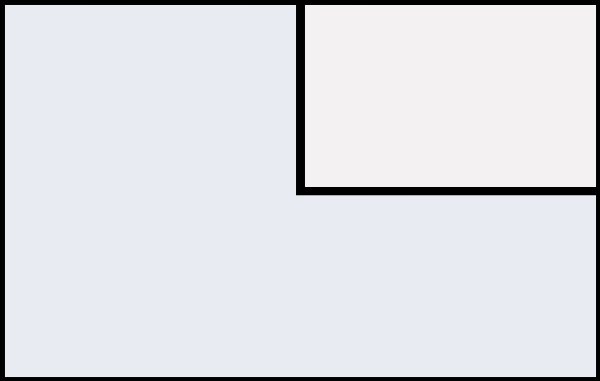 This section may take you a few minutes to complete. Make sure to finish the rest of the product page as well–like the product name, description, and category before publishing your product. Your WordPress auctions are now live on the WooCommerce Shop page. If you also have regular products, they are combined in the same gallery but differentiated with auction icons. Another way to include auctions on your website is by taking advantage of the YITH Auctions shortcode. 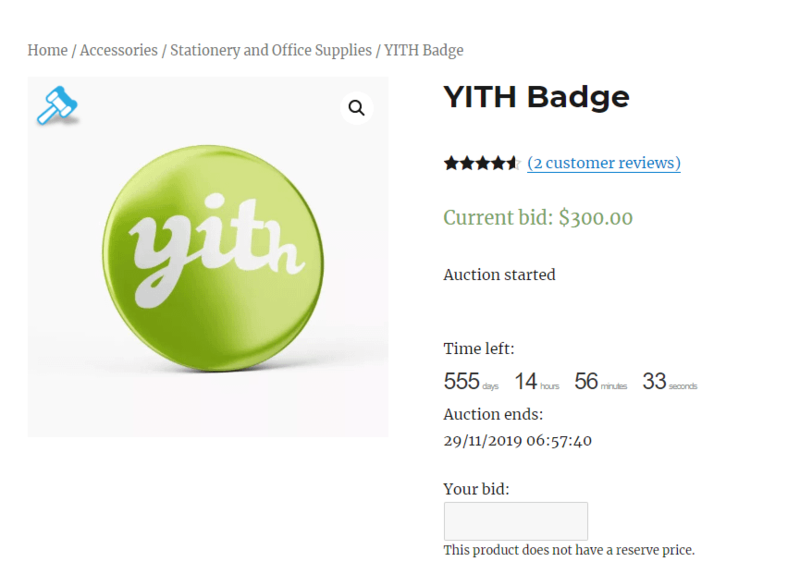 All you have to do is go to any page on your website and paste in the [yith_auction_products] shortcode. After publication, you’ll see the gallery of auctions. Finally, each product page with the auction categorization shows the time left in the auction, the current bid, and a field for the users to type in their bids. It’s a simple and intuitive design that you have the opportunity to customize yourself with CSS. During and after an auction, the admin has to keep tabs on what’s going on and fulfill the products as they sell. In order to do so, go to any product you currently have in an auction. Towards the very bottom of the dashboard product page there is a module with all of the bids currently made. If needed, you have the option to delete any bid. As for the orders, those are found in the Orders area of WooCommerce. At this point, you should have a working WordPress auction site! Have any other questions about WordPress auctions? Leave a comment and we’ll try to help out!